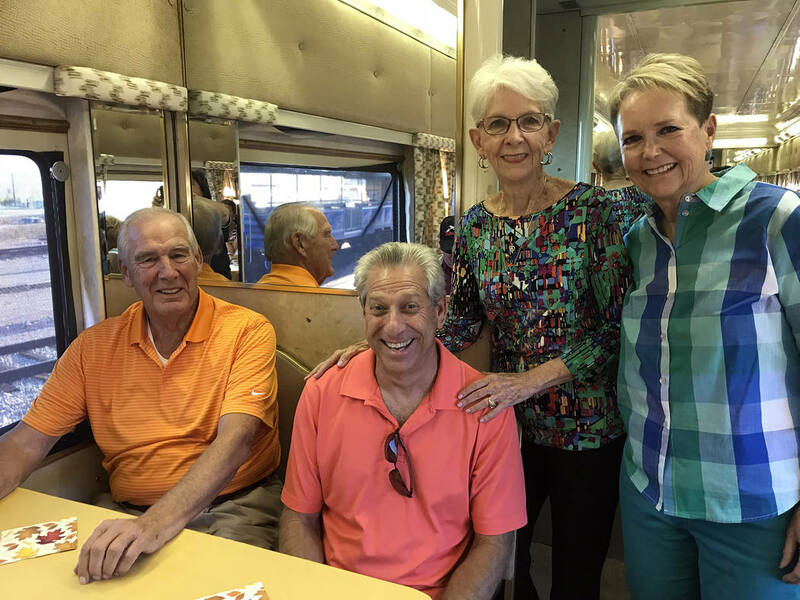 Among those attending Brews and Choo-Choos on Friday, Oct. 19, were, from left, Ross Johnson, Mark Fastow, Susan Johnson and Peggy Leavitt. Hali Bernstein Saylor/Boulder City Review Among those attending Brews and Choo-Choos on Friday, Oct. 19 were, from left, Ross Johnson, Mark Fastow, Susan Johnson and Peggy Leavitt. Hali Bernstein Saylor/Boulder City Review Randy Hees, director of the Nevada State Railroad Museum in Boulder City and member of the Boulder City Sunrise Club, served samples of the Hell's Hole Hefeweizen during Brews and Choo-Choos on Friday, Oct. 19, 2018. Hali Bernstein Saylor/Boulder City Review Rotary Club of Boulder City presented Brews and Choo-Choos on Friday, Oct. 19 which took passengers on a ride aboard the Nevada Southern Railway while offering a selection of beers from the Boulder Dam Brewing Co.
Hali Bernstein Saylor/Boulder City Review Duncan McCoy, president of Rotary Club of Boulder City, entertains those attending Brews and Choo-Choos on Friday, Oct. 19, before the train left the Nevada State Railroad Museum for the sunset ride and beer tasting event. Hali Bernstein Saylor/Boulder City Review Maylen Mosquera, left, sales manager, and Lana Wroblewski, hotel manager, from Railroad Pass Casino were at Brews and Choo-Choos on Friday, Oct. 19. 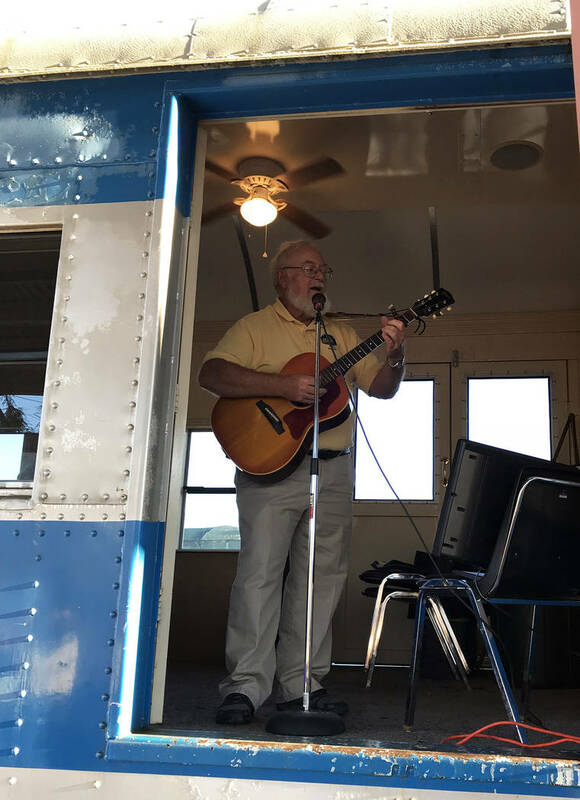 Railroad Pass was a sponsor of the train ride and beer tasting event. Hali Bernstein Saylor/Boulder City Review Todd Cook, owner of Boulder Dam Brewing Co., pours a coffee-infused stout during Rotary Club of Boulder City's Brews and Choo-Choos event on Friday, Oct. 19. Rotary Club of Boulder City presented Brews and Choo-Choos on Friday, Oct. 19, which took passengers on a ride aboard the Nevada Southern Railway while offering a selection of beers from the Boulder Dam Brewing Co.
Duncan McCoy, president of Rotary Club of Boulder City, entertains those attending Brews and Choo-Choos on Friday, Oct. 19, before the train left the Nevada State Railroad Museum for the sunset ride and beer tasting event. 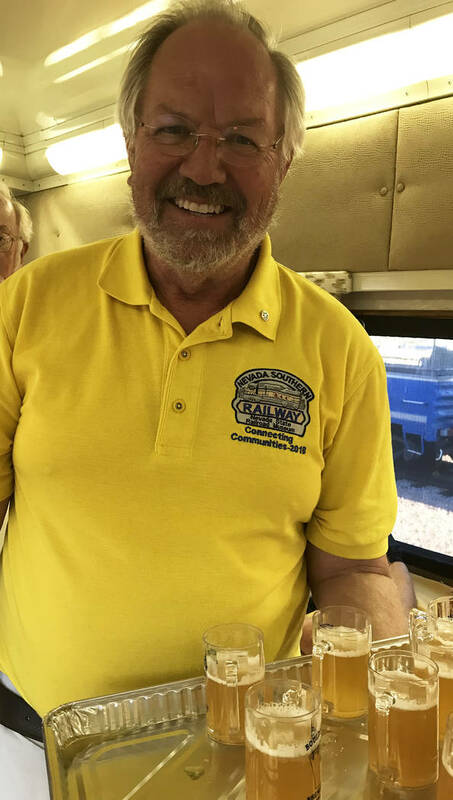 Randy Hees, director of the Nevada State Railroad Museum in Boulder City and a member of the Boulder City Sunrise Club, served samples of the Hell’s Hole Hefeweizen during Brews and Choo-Choos. 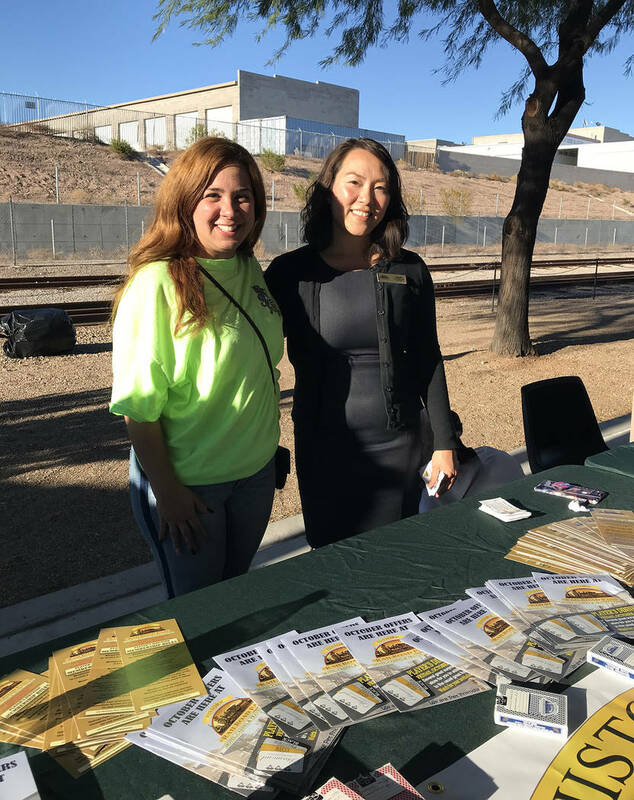 Maylen Mosquera, left, sales manager, and Lana Wroblewski, hotel manager, from Railroad Pass Casino were at Brews and Choo-Choos on Friday, Oct. 19. 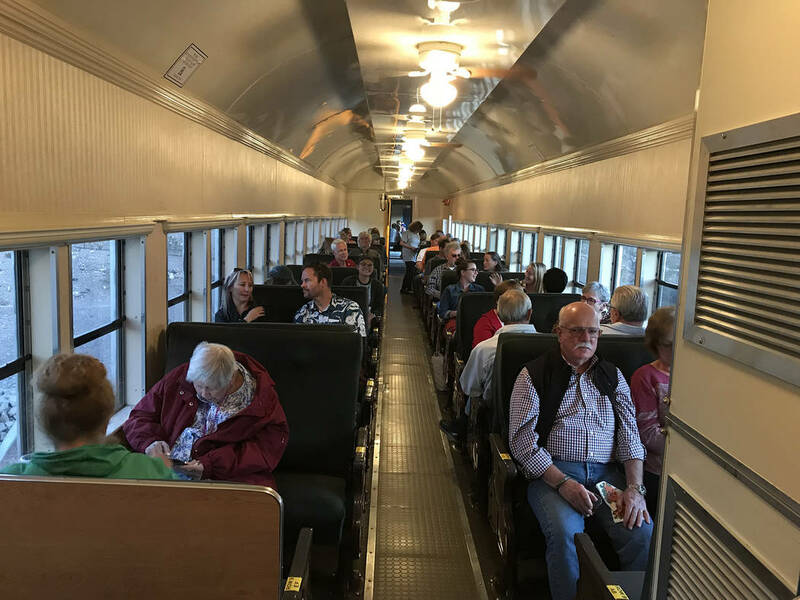 Railroad Pass was a sponsor of the train ride and beer tasting event. 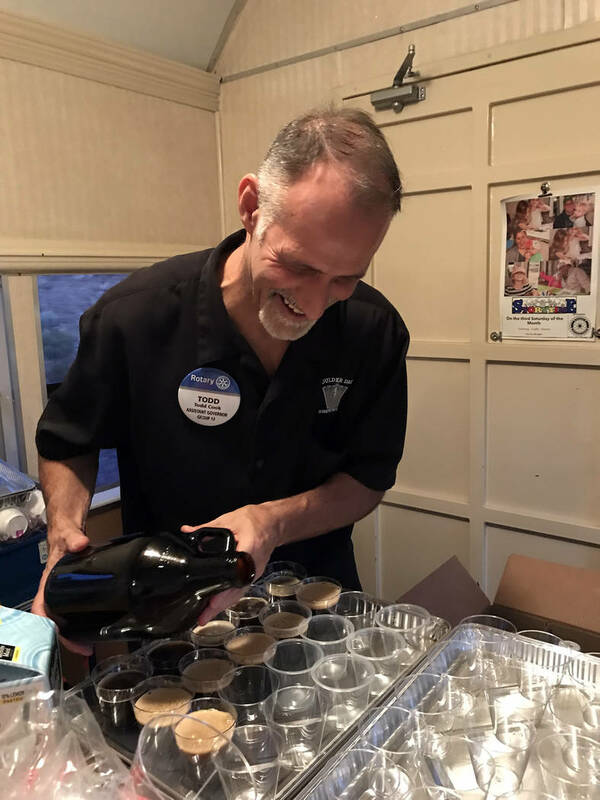 Todd Cook, owner of Boulder Dam Brewing Co., pours a coffee-infused stout during Rotary Club of Boulder City’s Brews and Choo-Choos event on Friday, Oct. 19.